International Business Machines (IBM), with a price of $187.57 is up only 1.1%. Interestingly, the Dogs of the Dow for 2014 have outperformed both the Dow index as well as the S&P 500 Index on a year to date basis. As the below table shows, the price only return for the Dogs of the Dow have returned 7.4% through Monday's close versus 7.0% for the S&P 500 Index and 3.0% for the Dow Jones Industrial Average. The Dow Dog strategy consists of selecting the ten stocks that have the highest dividend yield from the stocks in the Dow Jones Industrial Index (DJIA) after the close of business on the last trading day of the prior year. Once the ten stocks are determined, an investor would invest an equal dollar amount in each of the ten stocks and hold them for the entire year. Investors should note the strategy has generated mixed results over the years though. After reading some of the market headlines last week, one would have thought the market experienced some type of terrible correction. 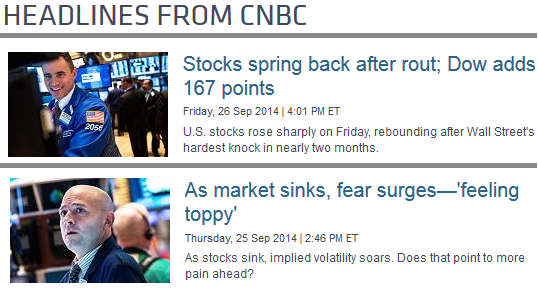 A couple of headlines from CNBC that are shown below mention the market "springs back after rout" and market "sinks, fear surges." 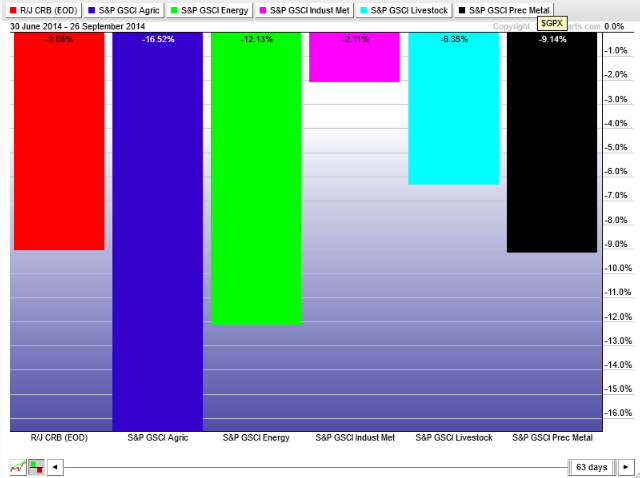 For the week, the S&P 500 Index was down 1.4% while the Dow Jones Industrial Average declined only 1%. On Thursday, September 18, 2014, the S&P 500 Index hit a closing high of 2,011.36. So, after this past Thursday's market decline, the S&P 500 Index was down 2.26% and ultimately closed the week down only 1.42% from its high. I do not call this a "rout" or a market that "sinks." Of course, the market seems overdue for a 10+ percent correction, but that does not mean one is around the corner. 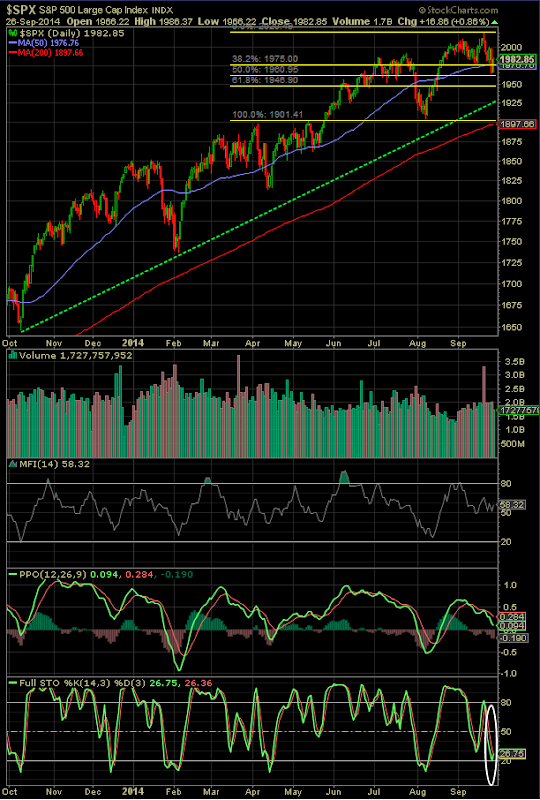 For the DJIA the last one occurred almost three years ago with the market low in October, 2011. As we noted earlier in the year the market seemed to experience an internal correction when social media and biotech stocks declined sharply in March and April. In the current third quarter it seems a similar situation is occurring as noted by the correction in some market segments. Additionally, a number of energy stocks and industrial stocks have experienced greater than 10% declines in the quarter. Lastly, in reviewing a couple of technical aspects for the market, the S&P 500 Index, it remains firmly in an uptrend as noted by the green support line in the below chart. Certainly, some technical damage has been inflicted on the market in last week's minor pullback. The market has violated its 50-day moving average and the percent price oscillator (a version of the MACD) is in a negative downtrend as well. From a positive standpoint, the stochastic indicator appears to be turning higher and a positive turn in the PPO would be beneficial. Lastly, the percentage of stocks trading above their 50 day and 150 day moving averages are near oversold levels. The market may find support at the 50% Fibonacci retracement level of S&P 1,960. Before looking at the week ahead, the economic news last week can be summarized as mixed. Probably the most noteworthy news items had to do with data out of Europe and China. The manufacturing and services sector PMIs for the eurozone dipped to their lowest levels of the year and China existing home sales declined. Potentially offsetting these concerns is the strengthening U.S. Dollar and the resulting impact of making foreign goods cheaper as they are exported to the U.S. The coming week is loaded with a number of important economic reports. For the week ahead magazine below, a number of links look at recent buyback activity as well as the performance of various market sectors. With a number of individual stocks experiencing significant corrections, one link reviews the fact some stocks just do not mean revert as investors might think. In short, just because a stock looks cheap, it does not mean it will generate market beating returns. And finally, it has been difficult gauging a great deal of insight into investor market behavior based on their sentiment as it has not been overly optimistic nor overly pessimistic. 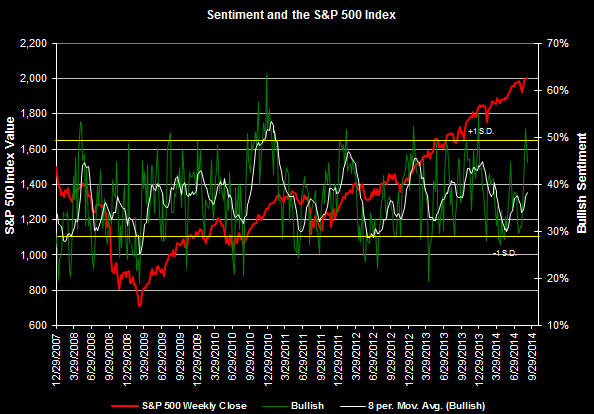 The Gallup article link notes that the "U.S. Investor Optimism Index is at its highest level in Seven Years. This index is officially know as the Wells Fargo/Gallup Investor and Retirement Optimism Index. I have not reviewed the questions/data closely; however, the index had prior peaks in 2000 and 2007, both market tops. The current index level, though, is far below the 2007 peak. "For the 12 months ending June 2014, S&P 500 issues increased their buyback expenditures by 26.6% to $533.0 billion from the $420.9 billion posted during the corresponding twelve month period in 2013." "Companies on aggregate...issued fewer shares, with the net change resulting in a lower share count and higher earnings-per-share (EPS)." "By reducing their share count, more companies are adding tailwinds to their EPS," says Silverblatt. "During the second quarter, 23% of S&P 500 issuers reduced their year-over-year share count enough to push up their earnings per share significantly versus just shy of 20% during Q1 and 12% during the second quarter of 2013." In the report Howard Silverblatt also comments on the continued need for companies to spend more on buybacks going forward in order to prevent share dilution from employee options that are in the money. These employee options have gained in value as the equity market continues to move higher. 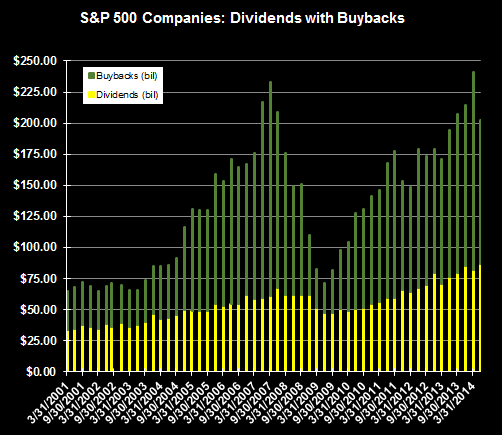 This potential increase in buybacks would provide support for a respective company's share price. 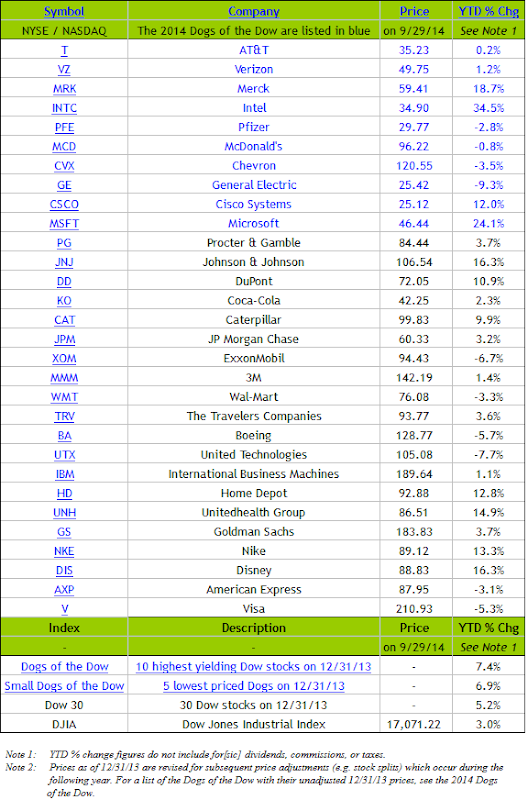 The report contains a number of useful tables with dividend and buyback data. 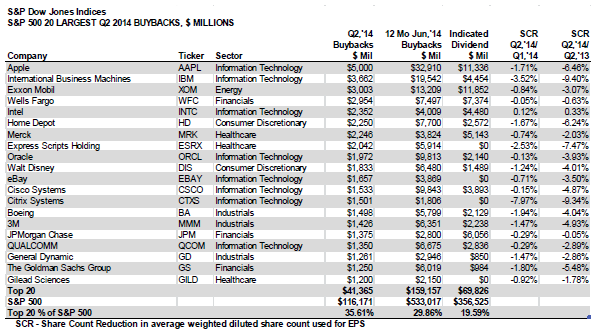 Below is the table detailing the top 20 or largest buybacks in the second quarter. A fairly eventful week last week with the Fed's policy decision essentially leaving rates unchanged and retaining the "considerable time" language in its rate announcement. Alibaba's (BABA) IPO was one for the record books in terms of size. Before investors jump in to buy the stock they should read Aswath Damodaran's commentary on the corporate structure of BABA. With those two items now in the rear-view mirror, the market managed to generate mostly positive returns last week. The one segment of the market having trouble gaining any upward traction is small cap stocks. On the week the Russell 2000 small cap index was down 1.2% and now is down 1.4% on the year. 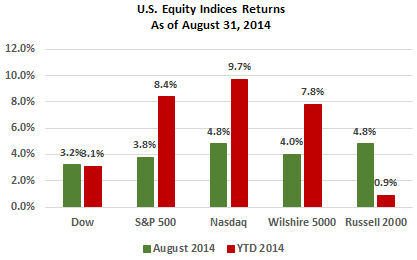 The other broad U.S. indices have generated near double digit returns year to date. The one large cap laggard is the Dow Jones Industrial Average which is up 4.2%. A number of additional reports will be reported in the coming week, but those noted above are likely to be the most impactful to the markets. This week's magazine contains an assortment of articles readers may find of interest. It has been almost a year since taking a look at the Beveridge Curve. In the earlier posts we noted the curve compares the unemployment rate with the job vacancy rate. The job vacancy measure we have used in prior posts is the data from the Job Openings and Labor Turnover Survey or JOLTS report. 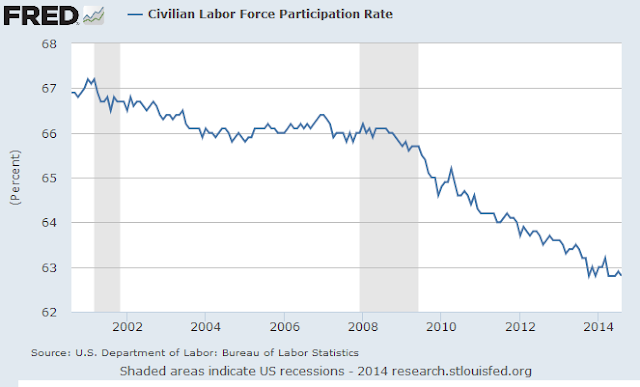 The limitation of the JOLTS report is data only began to be collected in December 2010. 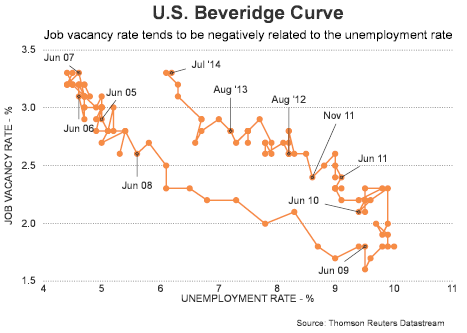 The importance of the Beveridge Curve analysis is the graph provides insight into potential structural unemployment. As the below graph shows, the curve has shifted upward and to the right indicating there may be a structural unemployment issue as job openings are going unfilled. 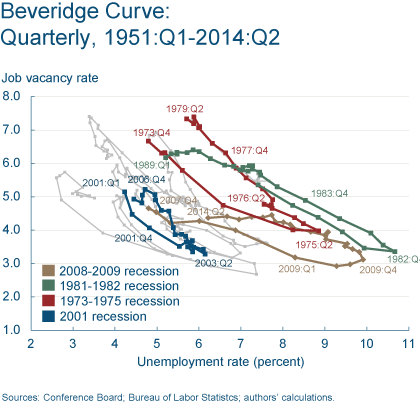 On the other hand, the Cleveland Federal Reserve Bank recently released a report that looks at the Beveridge Curve shift with data going back to 1951. For pre-JOLTS data, the report incorporated the Conference Board Help-Wanted Online Index (HWOL). As the graph in the Cleveland Fed report shows, the most recent data point has moved inside the curve generated after the 2001 recession. "However, one thing is clear: there is no shift to begin with. We believe that this debate and the ensuing evidence showed us that inferences about complicated and ill-defined concepts such as structural change in the labor market cannot be made by just looking for a break in the simple (and reduced-form) empirical relationships between macroeconomic aggregates in the midst of a deep and long recession." As an aside, one aspect of this recovery that seems to gain a great deal of attention is the continuing decline in the labor force participation rate. The conversation around this data point leads to a discussion that if these non-participants were included in the unemployment data, one, the unemployment rate would be higher and two, the Beveridge Curve would show a more pronounced shift up and to the right. For some, this shift would indicate a structural unemployment issue in this recovery. For a detailed look at participation rate information, Bill McBride of the Calculated Risk blog provides a comprehensive analysis of participation rate data. Although much of the economic news last week came in on the positive side, the major U.S. indices were unable to move to the upside. As we noted in our earlier post today, September And Beyond, investors seem focused on the Fed meeting this week and the Fed's viewpoint on the economy and timing of interest rate increases. In spite of the market pullback last week, the S&P 500 Index is down only 1.1% from the high reached on September 5th. Given the potential shift on interest rate policy from the Fed, a number of article links in this week's magazine look at the frequency of stocks and bonds declining simultaneously--and it is not a frequent occurrence. Another article link evaluates the markets' performance during mid-term election cycles as well as the pre-election year. Lastly, several articles look at projected economic growth along with corporate actions around dividends and stock buybacks. Below is the link to the coming week's magazine. Taking a look at some technical and fundamental data points that have evolved in September, below we provide insight into our thoughts on the market over the next few quarters. We look at a number of technical indicators, i.e., charting technicals, in an effort to gain some insight into investors' trading sentiment. A number of recent technical indicators have, what we would call, rolled over, which is a negative from a short term market direction point of view. 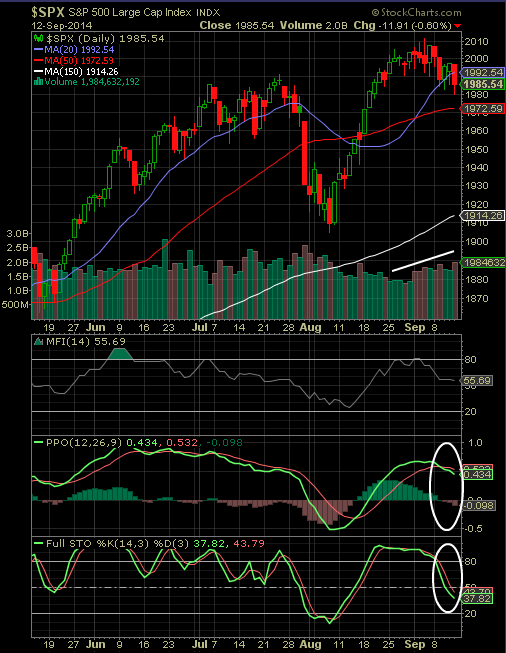 As the below chart indicates, both the PPO and Stochastic indicators are indicating a negative trend for the S&P 500 Index. "September is still the worst performing month and it is beginning to live up to this reputation once again this year. Average losses since 1950 for September are: DJIA –0.8%, S&P 500 –0.5% and NASDAQ (since 1971) –0.5%." "Historically speaking September weakness has been a great time to load up on stocks ahead of the “Best Six Months” of the year, November to April and an even better time in midterm years ahead of the best two consecutive quarter span of the four-year-presidential-election cycle." 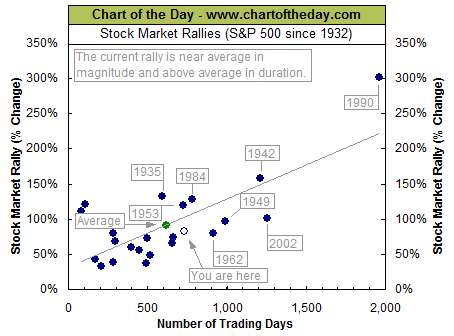 "The market’s sweet spot of the Four-Year Cycle begins in the fourth quarter of the midterm year (2014). The best two-quarter span runs from the fourth quarter of the midterm year through the first quarter of the pre-election year, averaging 15.3% for the Dow, 16.0% for the S&P 500 and an amazing 23.3% for NASDAQ. Pre-election Q2 is smoking too, the third best quarter of the cycle, creating a three quarter sweet spot from midterm Q4 to pre-election Q2. Applying these average gains to yesterday’s closing prices puts DJIA at 19675, S&P 500 at 2315 and NASDAQ at 5656 at the end of Q1 next year." One factor we believe influenced the market last week is the coming week's 2-day Fed meeting beginning on Tuesday. The Fed announcement will be at 2:00pm on Wednesday. Some strategist are concerned about the Fed's end of quantitative easing in October, along with the Fed's focus on getting interest rates to a more normal (higher) level. Janet Yellen's indicators du jour are related to employment. On Friday, September 5, the August non farm payroll report of 142,000 was below the consensus estimate of 230,000. One would expect this weak number to indicate the Fed will not hike rates anytime soon. On the other hand, the August payroll number is nearly always revised and the market is anticipating a revision higher; hence, higher rates sooner versus later? In the short run, at the onset of an increasing interest rate cycle, equities can face some headwind in the initial stages of rate increases. At HORAN, we do not see the Fed increasing interest rates before mid-2015 though. In anticipation of higher rates, the market can cause rates, especially longer term ones, to rise in advance of a Fed rate hike. Some of the equity market's weakness this month is related to this. For example, the 10-year treasury rate has increased from 2.33% at the end of August to 2.61% at Friday's close. Until a clearer perspective is gained on the Fed's rate view, we believe the 10-year trades in a range from 2.30% to 2.75%, maybe as high as 3%. One factor keeping a lid on higher interest rates in the U.S. is the fact rates in the U.S. are much higher, relatively, than rates outside the U.S. A part of this rate differential is being driven by the ECB's desire to embark on a significant QE program as well. This is resulting in foreign investors allocating investment funds into U.S. bonds and other U.S. investment assets. Also, with the recent increase in U.S. interest rates, this has led to a strengthening U.S. Dollar as evidenced by the trade weighted U.S. Dollar Index below. 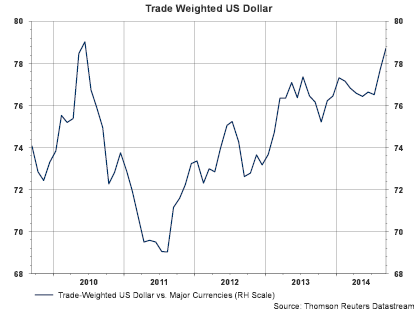 Since July the Trade Weighted Dollar Index has increased from 76.5 to 78.7 in September. A strengthening Dollar, versus other currencies, results in foreign investors gaining additional return when they convert the Dollar back into their home currency. A strong Dollar also results in imports being cheaper, the U.S. is a net importer, thus providing for potentially cheaper goods for consumers. A strong Dollar also results in oil prices declining which translates into cheaper gasoline at the pump. Therefore, cheaper import prices and cheaper gasoline can be a positive for U.S. consumers which can lead to improved retail spending. As noted by Econoday, Friday's retail sales number of .6% matched expectations, but July was revised higher at .3%. These retail numbers alone suggests the economy may be stronger than the labor market numbers might suggest. Consumers account for nearly 70% of GDP or economic growth, so this could lead to improved GDP growth in the U.S. During the last week of August, the second reading on second quarter GDP saw an increase to 4.2% versus 4.0% in the first reading at the end of July. Lastly, related to the consumer, we are seeing other commodity prices decline. For example, in agriculture, commodities such as corn have fallen over 27% since May. We believe this will eventually lead to lower beef, pork and chicken prices. From a broad perspective, outside the U.S., economic data suggests economies are still growing. And although some recent data shows slowing economic activity abroad, the data is not suggesting contraction. On the margin then, foreign economies have stabilized. With respect to geopolitical concerns and there certainly seems to be many. This type of risk might be reason enough for the market to climb that proverbial "wall-of-worry." The middle east issues do not have the same impact on the U.S. as in the past given the U.S.'s improved domestic energy market, primarily a result of fracking. Putin and his war in Ukraine is certainly one we continue to watch. The middle east and Ukraine issues are known and are likely mostly reflected in current asset prices. Of bigger concern might be the unknown unknown. It is this type of event that is not reflected in current asset prices. Breaking down the five-year run allows us (NDR) to identify the likely next phases. Below are three scenarios and likely leadership trends if each unfolds. Description: Renewed corporate confidence leads to more hiring and capex. The Fed would be able to normalize policy as real GDP approaches 3-3.5%. 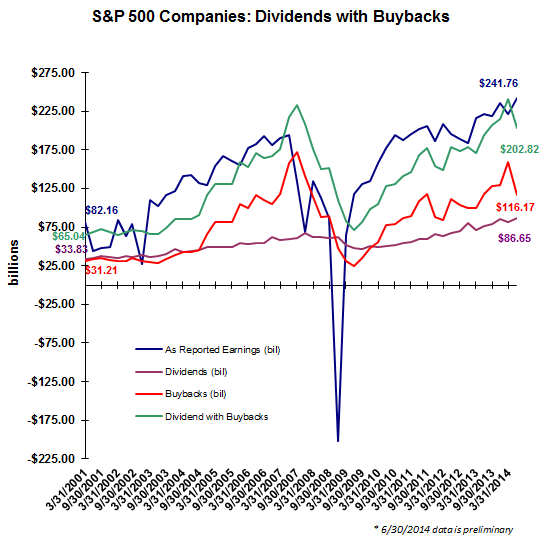 Leadership: Dividend (and to a lesser extent buyback) fixation could be replaced by capex beneficiaries. Mid and late-cycle sectors such as Industrials, Energy, and Technology have capex support. Styles could be less Growth-oriented. Description: If escape velocity is unattainable at this time, the Fed may choose to remain extremely accommodative by not raising short-term rates or even instituting QE4. The combination of the Fed’s forcing investors into riskier assets and lack of earnings growth could push valuations to levels not seen since the late 1990s Tech bubble. Leadership: Bubble phase - Growth stocks that can deliver in a slow-growth environment and yield plays. Bubble aftermath – defensive sectors not caught in the bubble. Description: If the economy fails to reach escape velocity but the Fed normalizes policy, then stretched valuations suggest the market is vulnerable to a correction. As long as a recession is avoided, any correction should be limited to less than 20%. Continued modest earnings growth would lower multiples. Defensive Value sectors, which would benefit from the likely decline in long-term interest rates during a correction. No ambiguity is evident when we view the past. Only the things that happened happened. But that definiteness doesn’t mean the process that creates outcomes is clear-cut and dependable. Many things could have happened in each case in the past, and the fact that only one did happen understates the variability that existed. What I mean to say (inspired by Nicolas Nassim Taleb’s Fooled by Randomness) is that the history that took place is only one version of what it could have been. If you accept this, then the relevance of history to the future is much more limited than may appear to be the case. Knowing the probabilities doesn’t mean you know what’s going to happen. Bruce Newberg says, “There’s a big difference between probability and outcome.” Unlikely things happen–and likely things fail to happen–all the time. Probabilities are likelihoods and very far from certainties. His letter is a worthwhile reading for investors. The potential risks facing investors searching for yield is elevated in an environment where the Fed has pushed interest rates to near zero. Equally, the search for capital appreciation is equally challenging as equity prices are no longer at levels reached subsequent to the financial crisis. Last week's holiday shortened trading saw fractional gains in most major U.S equity indexes except for the small cap Russell 200 Index. The small cap index declined .4% on the week and only remains up .6% for the year. 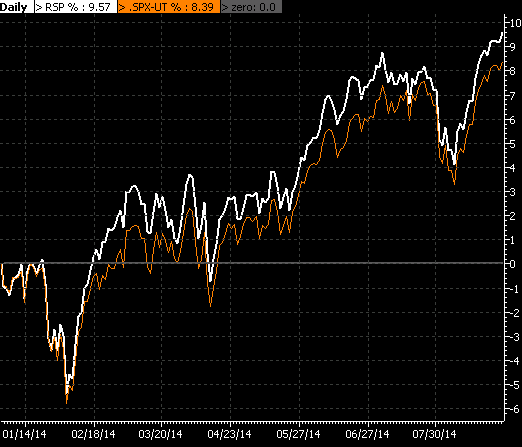 Small caps continue to lag the broader S&P 500 Index which is higher by 8.6% year to date through Friday's close. The one piece of weak economic news reported last week was the +142,000 increase in non-farm payrolls. The consensus estimate prior to the release was an anticipated increase of 230,000. The market seemed to shake off this miss as the month of August tends to be a particular month that is frequently revised. The coming week will be light on potential market moving economic reports. Jobless claims will be reported Thursday and retail sales will be reported on Friday. Given the importance of the consumer on GDP, the retail report will be watched closely. The magazine link below includes an article by Liz Ann Sonders of Charles Schwab highlights sentiment data, GDP component changes from Q1 to Q2 and a number of additional pros and cons on recent economic data. Lastly, the U.S. market has managed to dismiss geopolitical events around the globe. An event that will take place on September 18th is the Scottish referendum to separate from the United Kingdom. A couple of articles in the magazine touch on the potential significance if the referendum is approved by the Scottish citizens. This week's sentiment survey from the American Association of Individual Investors notes bullish sentiment declined 7.25 percentage points to 44.67%. Two thirds of the decline went into the bearish category while the other one third went into the neutral category. A less volatile measure is the 8-period moving average of the bullish sentiment reading and it rose to 38.3% from last week's 37.4%. The 8-period moving average is not indicating either an overly bullish sentiment or an overly bearish sentiment environment. As a point of reference, 2013 saw strong market returns from the S&P 500 Index and sentiment readings at the end of 2012 compared to this latest report are noted below. 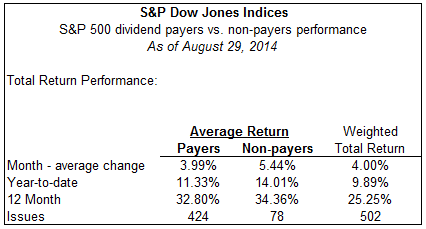 The equal weighted return of the dividend payers in the S&P 500 Index continues to lag the return of the non payers in August. As a consolation though, the payers equal weighted return is ahead of the cap weighted S&P 500 Index on a YTD and 12-month basis. This equal weighted outperformance of the non-payers has carried over into the performance of Guggenheim's equal weighted S&P 500 Index (RSP) versus the cap weighted S&P Index as noted in the below chart. A number of the larger cap dividend payers have struggled on a year to date basis with a number falling in the consumer discretionary sector and industrial sector. For example, on a price only basis, Boeing (BA) is down 7.10%, United Technologies (UTX) is down 5.11%, General Electric (GE) down 7.31%, Best Buy (BBY) down 20.04% and Bed Bath & Beyond (BBBY) is down 19.98%. The strong equity returns in the just completed month of August prove historical expectations do not always play out as the data might suggest. As we noted in our post just before August began, Is This The Much Awaited Market Pullback?, the average August return for the past 10 years has been negative. With the strong August returns several market pundits are reiterating their often repeated call for a major market correction. A correction would not surprise us, but we do not see the 30 - 60% that is predicted by some investment managers. Several article links in this week's magazine provide insight into these repeated correction calls; one by Barry Ritholtz on David Tice's correction call and the other by Larry Swedroe covering John Hussman's bear market point of view. The coming week is a holiday shortened one with a number of important economic reports. Most watched will be the data surrounding employment. Jobless claims will be reported on Thursday and the employment situation report will be released on Friday. The employment data is getting closer scrutiny as Janet Yellen has noted the labor market is weaker than it should be. Econoday notes, the employment report likely will play a key role in the next round of Fed forecasts for the economy, posted with the September 17 FOMC statement. "The key question is when will the Fed begin to raise rates. Making up for the light article links from last week, the Monday holiday allowed for me to include a few more articles that might be of interest for the coming week. Below is the link for this week's magazine.